At beginning of World War II there was a large dockyard model of a Dutch twodecker in the Monbijou Palace museum in Berlin. It was dated to 1660 - 1670 and astonishingly rich in detail. All parts of hull and rigging were finely worked out. The length overall was 2.67 m, scale was 1 : 21. 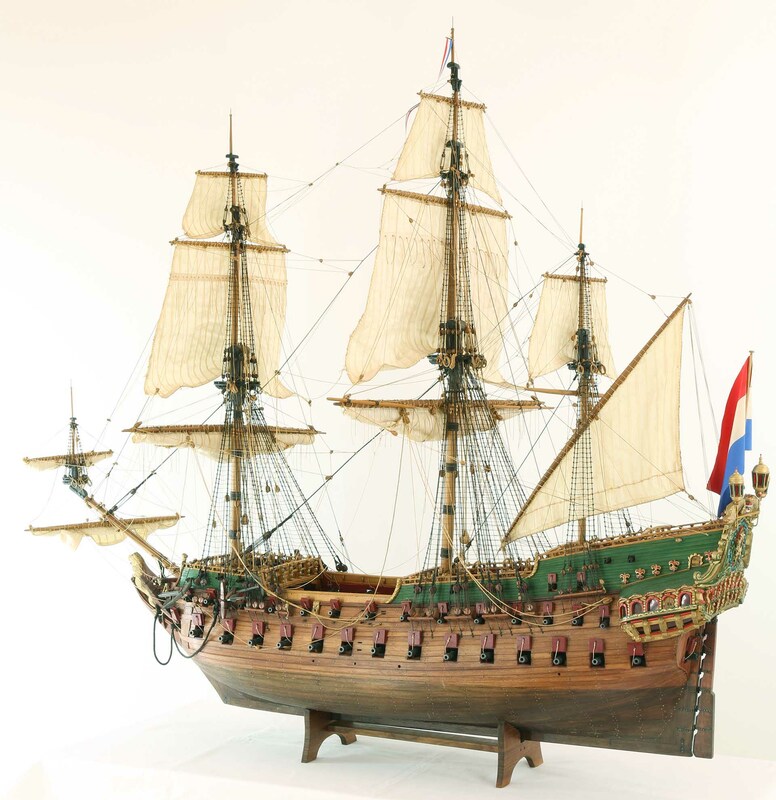 It was one of the very few large models from 17th century that did still exist. The model was surveyed, extensively photographed and described by Heinrich Winter. The pictures and plans were published in his book Heinrich Winter, "Der holländische Zweidecker von 1660 / 1670", Verlag Delius, Klasing & Co, Bielefeld, 1978, ISBN 3-7688-0094-6. The model had removable parts at the main hatch. So many photos of the ship's interior could be made. The pictures are so good that one can easily image to be under deck in a real ship. Unfortunately the dockyard model was burned in one of the bombing raids during the war. But the description, photos and surveying were so carefully made that rebuilding it as a model can be done very well. The model is a very fine piece of work that makes a great display, especially in a large room, e.g. a hotel lobby or reception area. The model clearly shows the impressive lines of hull and rigging that were typical of ships of that age. All the details of hull and rigging were carefully worked out. The decoration carvings, however, were not executed not as extensive as on the dockyard model. The gratings of the main hatch and the after-hold hatch can be taken out to allow for a clear view on the fully equipped gun deck below. The modeler gave the planking of hull and deck some signs of wear and tear. By this the model got a lively character and pleasant look. The finely worked, detailed ship model is 1 : 44 scale. Length is 138 cm, width 62 cm, height 128 cm. There are several views of the entire ship model taken from all directions, and several closer views of hull, deck and rigging. Click images to enlarge!